For the Education Hub Program classes. You will be a hardworking and enthusiastic teaching professional with excellent English teaching methodology.One or two years experiences of teaching English in the secondary levels will be a good advantage. 4. 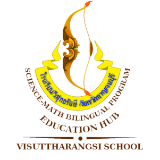 Would like to work with Thai teachers and secondary level students. For the Education Hub Program classes. You will be a hardworking and enthusiastic teaching professional with excellent science and biology knowledge. One or two years experiences in the secondary levels of teaching science and biology will be a good advantage. Kanchanburi is located in the area which is one of the most beautiful and interesting places in Thailand. It is famous for historical sites, resorts, waterfalls, rivers and mountains. It is about 2 hours driving from Bangkok. The cost of living here is lower than that in Bangkok. Salary: 30,000-35,000 (Starting) and the promotion is considered 1-4% increased every year. The school provides the visa and work permit fee 5,000 baht a year of the contract. The teachers get 12 months paid according to the 12 months contract as well as 20 days off in October and 1 month off in April for the holidays. For more information, call Benjamas on 081-4342351 between 9 am. and 4 pm.on the weekdays and 10 am.-2 pm. at the weekend. Note: The first semester will open on 1 May, 2019.